Councillors Razia Daniels and Neil Sullivan (Handbridge Park) are delighted to inform you that Post Office will be opening a counter with a wide range of services in Handbridge in McColls, 1 Queen’s Park Road, Handbridge, Chester. "This is absolutely fantastic news for our community as we know how much everyone misses having a Post Office in Handbridge. "As your local councillors we have received many requests from residents, particularly the elderly and young mothers, that they would like and would support a post office counter in the new Co Op and it would make it more likely that they would use the shop. "We were disappointed to learn that there were no plans for post office counter facilities at the new Co-op to be opened in Handbridge. As your local councillors we have tried to arrange a meeting with the Co-op to ask them to consider applying for a post office counter in their new shop in Handbridge. "We tried a few years ago to get The Post Office to look at finding a site in Handbridge. We have been working very hard in the background trying to see how we can encourage the Post Office to have a branch in the new Co-Op. 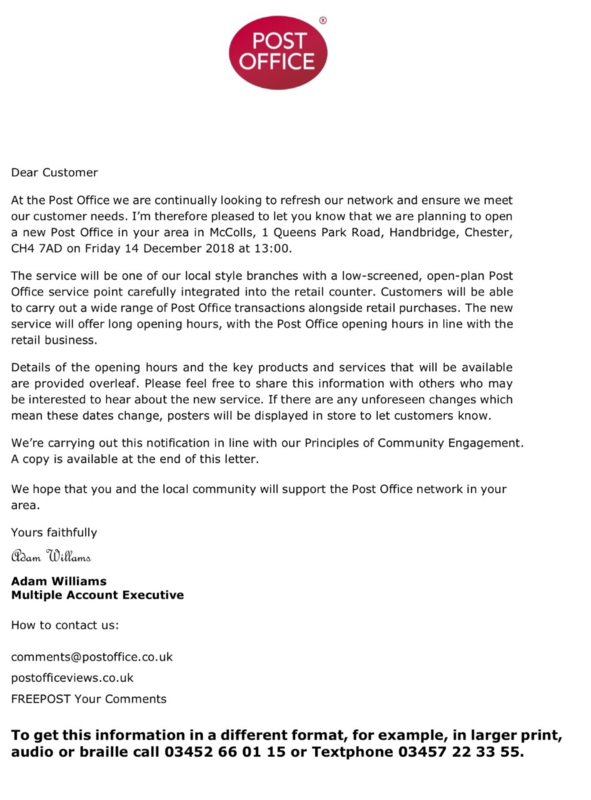 "Today we received attached notification to say that Post Office will open in the McColls. We welcome this fantastic news for our community."